Presenting ‘Ecological Economics from the Ground Up’ at the recent Green Book Fair in Brussels, Joan Martinez-Alier spoke to a rapt audience of decisionmakers, academics and activists. Speaking on the green economy, one topic addressed by the book, Martinez-Alier’s remarks were critical of the notion and its agenda of green growth as interpreted by UN agencies and governments on the back of last year’s Rio+20 in Brazil. From Martinez Alier’s point of view, ongoing debate on the dominant vision of the green economy is critical if we are to understand whether the drive toward so-called green economies is likely to solve, or in fact exacerbate sustainability woes. As well as providing useful distinctions between ecological economics, bio-economics and environmental economics, Martinez-Alier inspired listeners by describing his experience with co-operative research, an approach upon which the EJOLT project1 is founded, whereby information is gathered and case studies are co-generated by activists and sustainability scientists. ‘Ecological Economics from the Ground Up’ is indeed the end product of such efforts, based on case studies developed under the CEECEC (Civil Society Engagement with Ecological Economics), project, a precursor to EJOLT. The book features 18rich case-studies from all corners of the world, covering topics chosen by civil society organizations (CSOs) such as ecological debt, zero waste or payments for ecosystem services and provides positive accounts of breakthroughs achieved by what Alier calls ‘the environmentalism of the poor’. 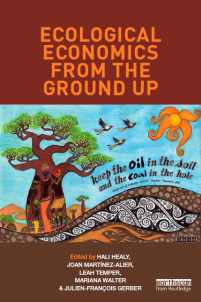 The book forms the core text of a unique online course on ecological economics / political ecology for activists, and is a valuable teaching / learning resource for CSOs, undergraduates following sustainability sciences and decision makers alike. 1 Funded by Science in Society under the Seventh Framework Programme (SiS FP7) of theEuropean Commission.